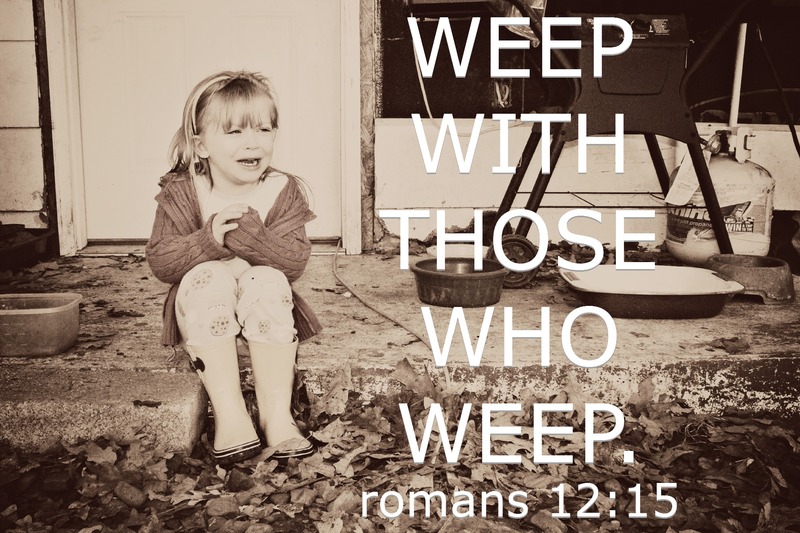 I’ve said it many times: I believe one of the greatest descriptions of the body of Christ is found in Romans 12:15: “Rejoice with those who rejoice, weep with those who weep.” Paul encourages the Christ-followers in Rome to a practice of mutual empathy, a posture of equal parts jubilation and grief. The Greek word for “weep” here is klaio; it is one of several words that would have been at Paul’s disposal in this writing. If he had intended to describe quiet, controlled shedding of tears, Paul would have used a different term entirely (dakruo). As it stands, klaio is descriptive of loud, audible weeping. It is lamentation, bewailing. Once you hear a klaio cry, you never want to hear it again. It’s a sound that rings in your ears for days. It is the sound of a heart breaking. Over the past few days, I’ve heard my fair share of klaio crying. That’s the thing about grief: no matter how many times you’ve been there before, you’re never prepared for his next visitation. It’s an awful, whole-bodied experience when grief takes you. All you can do is weep, tears without end. Gasping for air, gasping for life. And this is precisely the place Paul asks us to go together. When one of our number hurts, we all hurt. When one of our own weeps klaio, we all shed these tears of sorrow. And the impetus for this runs even deeper than the command of the apostle. The reason we weep with those who weep? In perhaps the most comforting narrative in the Gospels, Jesus receives news of Lazarus’ death in John 11. He arrives much too late; his good friend has already been laid in the tomb, Mary and Martha disconsolate, immersed in the weeping masses. Their cries are klaio, full-throated and fever pitch. It is this terrible, mournful sound that fills the ears of Jesus. It is this kind of cry that prompts his own tears to fall. As Mary and Martha weep, so too does Jesus. As the klaio tears stream down our cheeks, we have one who empathizes more than we know. Weep with those who weep, for this is the very heart of God. This week, we have been the klaio. We have wept, deeply. But we have also been greatly comforted. We are grateful for the blessing of community, for fellow sojourners who have immersed us in their own tears, in their prayers, in love and sympathy. You have wept with us, you have wept for us. You have become klaio along with us, a word of good news, Christ in our darkness. This entry was posted in Blessings, Devotional, Disappointment, Family, Gospel, Scripture, Theology and tagged Grief, John 11, Klaio, Mourn with those who mourn, Romans 12, Weep with those who weep. Bookmark the permalink. Very moving, Jason. God bless.